Price: £35 a year for an Under 26 pass. What you get: Unlimited free entry to all V&A exhibitions, Members-only previews, exciting events and the use of the V&A Members’ Room. Previous Exhibitions: I don’t think I’ve been to a paid exhibit at the V&A but I did enjoy the London Design Festival Graphics Weekend events and What The Font evening, all really good considering they were free! Future exhibitions: Alexander McQueen – tipped to be a good’un! How many times I have to visit to make it worth it: I think the ticket price depends on the exhibition but it’s generally around the £12-£15 mark so 3 times – pretty good value! Become a V&A member here. 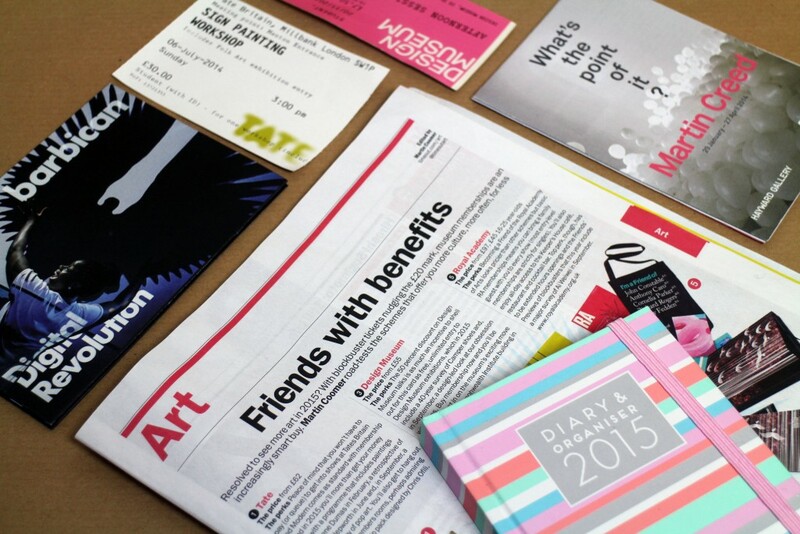 What you get: Unlimited access to all Tate exhibitions – both Tate Modern and Tate Britain. How many times I have to visit to make it worth it: The ticket price of the current Late Turner exhibition is £16.50 general admission so roughly 5 visits. How many times I have to visit to make it worth it: the last exhibition I went to was £7.50 for a student ticket, but the latest exhibition price is set at £12.60, so roughly 5 visits. Join the Design Museum here. What you get: Unlimited access to all exhibitions (PLUS a guest!) and Friends preview days. Become a friend of the Academy here. What you get: Unlimited entry to Hayward Gallery exhibitions, invites to special members events and various discounts including 10% off at Foyles. Future exhibitions: If I’m honest I’m not really sure – it seems there is a lot happening at the Southbank Centre in general but their website is pretty confusing so I can’t really make sense of it. How many times I have to visit to make it worth it: The Martin Creed tickets were £12 so 7 times roughly. Join the Southbank Centre here. What you get: Unlimited access to exhibitions as well as invited to members-only events and various other discounts. How many times I have to visit to make it worth it: Exhibitions are usually priced around £10 so 5, although I just discovered ‘Young Barbican’ for 16 to 25 year olds – discounted tickets, yay! What you get: Free entry to over 200 museums, galleries and historic houses over the UK, 50% off many major exhibitions as well as various discounts in cafés and museum shops. Buy a National Art Pass here. Make up your mind time… ok, I still haven’t actually made my mind up. I think I would get the most use from either the Design Museum, Barbican and Art Fund National Pass but I just can’t choose. Which should I go for? Help! If you have a membership to any of these, please let me know and guide me in the right direction. Great article Natasha! I have had a Tate Membership which was around £90 and you could always bring a guest: friends were battling it out to come with me to new exhibitions or to work / have a drink in the Member’s Cafe at the top of the Tate Modern. I was a translator that year and I visited a lot plus went to see that year many great exhibitions like the Yayoi Kusama one which I loved. I also laughed at your comments of the Southbank Centre, so true! I love the space and I think they have a great program but I always seem to miss things or give up going through their whole event calendar because of how overwhelming user experience is on the site. It’s just a 20 minutes walk from me so I should really try a little harder – maybe they have a handpicked newsletter or something. Have a good weekend!